The book of Hebrew mentioned of our accountability towards God. According to dictionary, cow means cow – female of domestic cattle or a large unpleasant woman; but in verb cow means subdue, restrain, or overcome by affecting with a feeling of awe; frighten (as with threats). So through choice of words will determine people like or dislike us. Thanks for reading my poetry and hope this poetry minister and bless you. 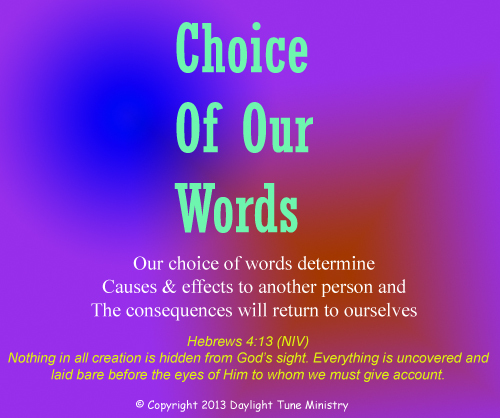 Posted in Acrostic, Poetry and tagged Abba, Bible, Cause, Choice, Christ, consequence, Cow, Creator, Determine, Effect, Father, God, Heavenly, Holy, Immanuel, Jesus, Lord, Messiah, Return, Saviour, Scripture, Son, Spirit, Word. Bookmark the permalink. Totally bear on own account. 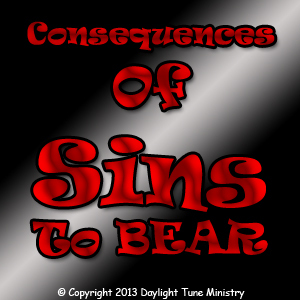 Posted in Acrostic, Poetry and tagged Christ, consequence, Cost, Creator, God, Holy, Jesus, Lord, Sin, Son, Spirit, Trespass. Bookmark the permalink. Thank Him and praise His holy name. To secure your descendants’ life and success. His instructions are like building your house upon the rocks. For He knows that we are weak. For He knows that we are from dust. In response to the Scriptures in reference to Genesis 1-3, Isaiah 42:6-8, Proverbs 31, and the New Testament. Posted in Free Verse, Poetry and tagged Action, Adam, bear, beauty, beguile, birth, bless, buise, captives, consequence, Creator, curse, daily, depend, down, Downfall, Eve, forgive, free, Heart, hefty, Hope, Humble, hurt, Husband, Immanuel, instruction, Let, Life, Lord, Messiah, nations, Oh, Painful, perfect, Praise, price, salvation, Savior, Saviour, Scripture, secure, Seed, Seek, Serpent, Sin, stray, strike, Success, Tempt, Thank, trust. Bookmark the permalink.